With creative space planning we can modernise your office, increase productivity and produce a more comfortable working environment. Every company’s requirements are unique, and therefore we approach each new project with an open mind to ensure these needs are met. We take into account the proposed space, the company’s working style (i.e. who needs to work where/with whom), corporate image, budget and of course personal preferences. 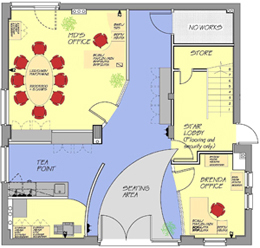 Our design team will prepare detailed AutoCad plans to illustrate the proposed scheme. These plans can then be developed and submitted for Building Control approval, Listed Building approval and Planning as is required for the individual project. "...Gifford Grant have done a very good job on remodelling our space, their work has been of a high standard, tidy and clean. I can highly recommend them to you".